An Astrophysics 'Breakthrough' Will Be Unveiled Thursday. Here's How to Watch. 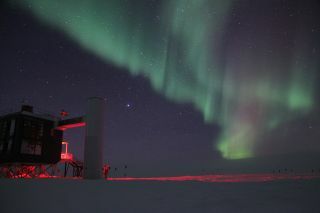 The aurora australis shines above NSF's IceCube Neutrino Observatory at NSF's Amundsen-Scott South Pole Station. An international team of astrophysicists will reveal a "breakthrough" discovery Thursday (July 12), and you can watch the announcement live. The U.S. National Science Foundation (NSF) announced in a statement that it will host a news conference Thursday at 11 a.m. EDT (1500 GMT) to unveil new "multimessenger astrophysics findings" led by the IceCube Neutrino Observatory, an NSF-managed facility at the South Pole. You can watch the briefing live here at Space.com, courtesy of the NSF, or directly via the NSF's YouTube channel. Olga Botner, former IceCube spokesperson, Uppsala University. Neutrinos are neutral particles that interact very weakly with other types of matter; many trillions of them stream unimpeded through Earth every second. Detecting them is therefore a challenge — one that the IceCube Neutrino Observatory has undertaken. The facility consists of 86 cables, each of which extends 1.5 miles (2.5 kilometers) into the Antarctic ice. Each cable holds 60 "digital optical modules," which themselves harbor supersensitive light detectors designed to pick up emissions sparked by rare interactions between neutrinos and water-ice molecules. "Multimessenger astrophysics" refers to the use of two or more different types of signals to observe a cosmic object or phenomenon. Last October, for example, researchers announced that they had studied a collision between two neutron stars by analyzing both the electromagnetic radiation and gravitational waves thrown off by the landmark event. So what do you think the IceCube Neutrino Observatory has found? We'll have to tune in Thursday to know for sure. Visit Space.com Thursday for complete coverage of the IceCube Neutrino Observatory discovery announcement.